KINGMAN – More Arizonans might accidently reset their clocks for daylight saving time before realizing the 2018 mid-term General Election is Tuesday. Political players on all sides are pushing for last minute influence and Kingmanites aren’t sitting on the sidelines. Members of the nationally known #RedForEd movement are striving to keep public schools intact and well-funded. Arizona educators are fighting Proposition 305, which proponents say will give parents the right to send their children to a school of their choice, such as private schools, and opponents say will take money away from public schools, a basic necessity of American education. Arizona #RedForEd activists and Prop 305 opponents launched a statewide movement earlier this year, getting the attention of state lawmakers. Those efforts are fighting into the last minutes. Tyler Griesbach, a 23-year-old, second-year Black Mountain School music teacher is heading the Legislative District 4 #RedForEd movement, which includes Kingman, Bullhead City and Lake Havasu City, and was one of about ten people, many of them teachers, at Locomotive Park on the chilly November Thursday night. Of the eight people at the park at 6 p.m., all of them were registered voters, and all have already voted via early ballot. Most of them hold professions courtesy of a public education. 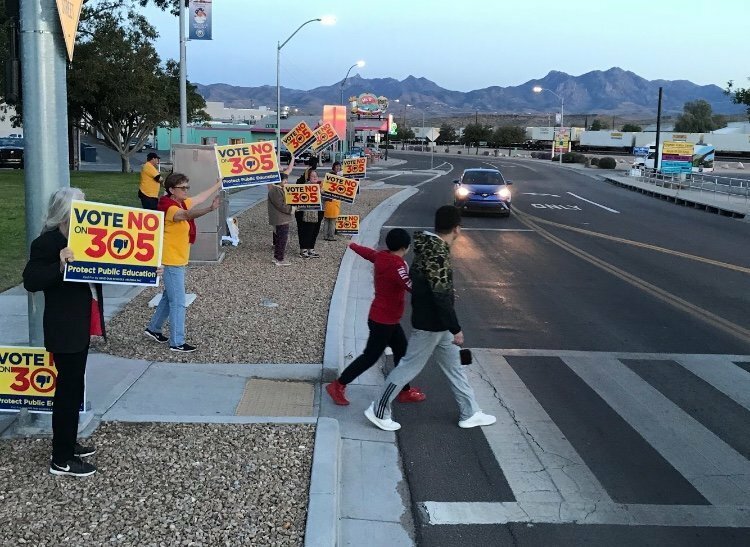 Former educator and Arizona Congressional Candidate Mikel Weisser was also braving the sidewalks of Route 66, holding signs and taking photos of fellow #RedForEd cohorts. “I don’t want to see money taken away from public schools,” he said. Others were products of the ‘school of life’ and understand the importance of education wherever they could get it. Marylin Houk, 63, grew up doing migrant work most Americans wouldn’t think of doing today. “We followed the fruits,” she said, referring to her early childhood day of migrating across the west coast picking fruit in California, Oregon and Washington. Houk is now an environmental service worker at Kingman Regional Medical Center and said she has a sixth-grade reading level. She said her reading and writing abilities came from whatever knowledge she could pluck from public schools and libraries. Locomotive Park is slowly becoming the center for local activism. Located between the Kingman Gateway Arch and the Kingman Visitor Center, tourists and residents get a view of what’s going on – from a social perspective – in Mohave County. Attendance in the park might get more diverse as the election cycles yield new results. Wednesday was the last day to mail in early ballots. Friday is the last day for early voting in person and Tuesday is Election Day. For information on candidates, ballot initiatives and polling places, go to the Mohave County Elections Department website at https://www.mohavecounty.us/ContentPage.aspx?id=118.